Incredible! That's what I can describe it. Incroyable! 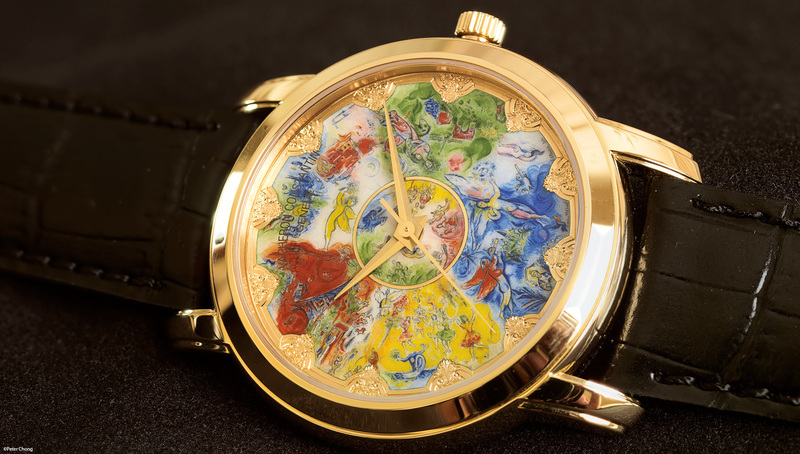 The Vacheron Constantin Metiers d'Art - Chagall & L'Opera de Paris piece is an exceptional work of art. I am quite speechless when I examined the work, done in enamel by Anita Porcet, an independent enamelist. 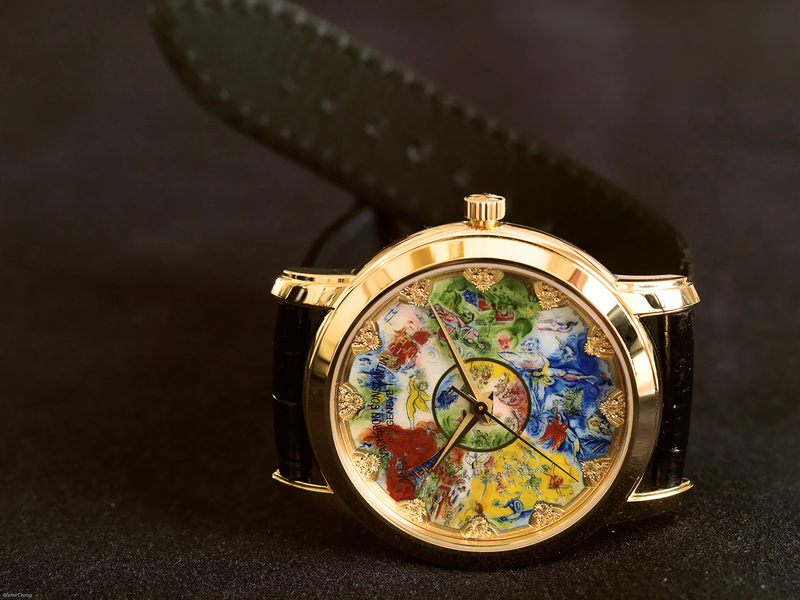 I normally am not too excited about enamel paintings on a watch dial. But this watch, has me quite excited...this is a piece of art. The work was originally commissioned to decorate the ceiling of the Paris Opera. This epic work is characteristic of the Marc Chagall's work - bright, delightful use of colours, nudes in various poses. This magestic work, unvealed in 1964 depicts Chagall's interpretation of the works of 14 composers. Vacheron Constantin decided to pay homage to this beautiful work by commissioning her own in the form of an enamel on a dial. 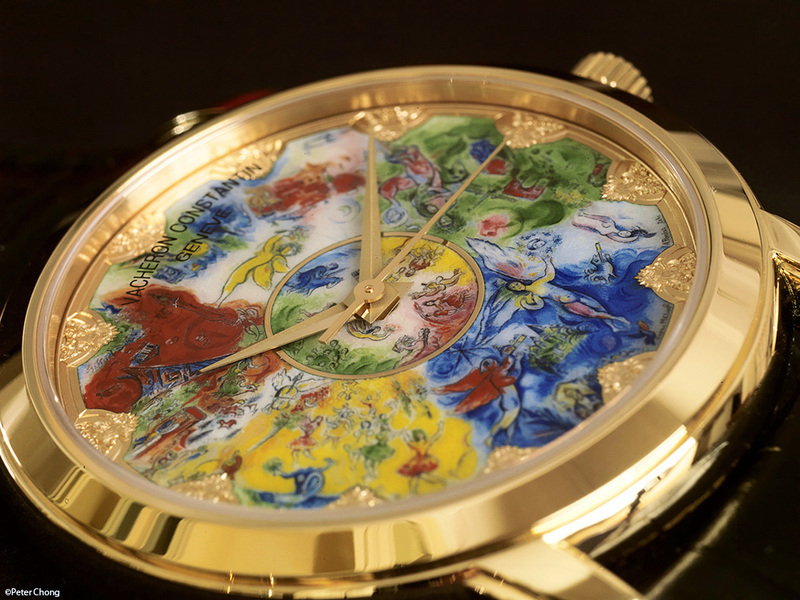 The entire work, miniaturized onto the 40mm diameter of a dial. This challange was taken by Anita Porcet, an extraordinary enamel artist of our age. The watch is in a 18k yellow gold case, with a hunter style back. 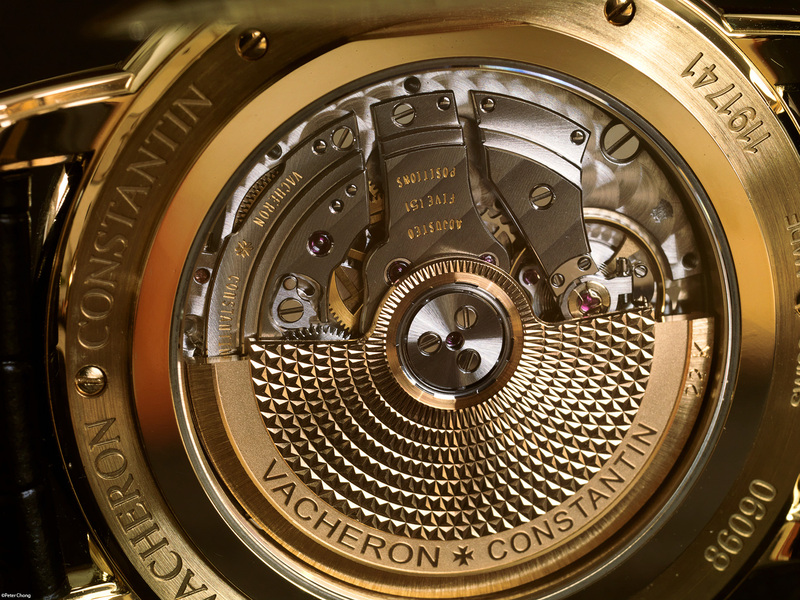 On opening the case back, reveals the movement -the inhouse caliber 2460 automatic movement. The VC cross logo on the inside of the caseback is a sticker. 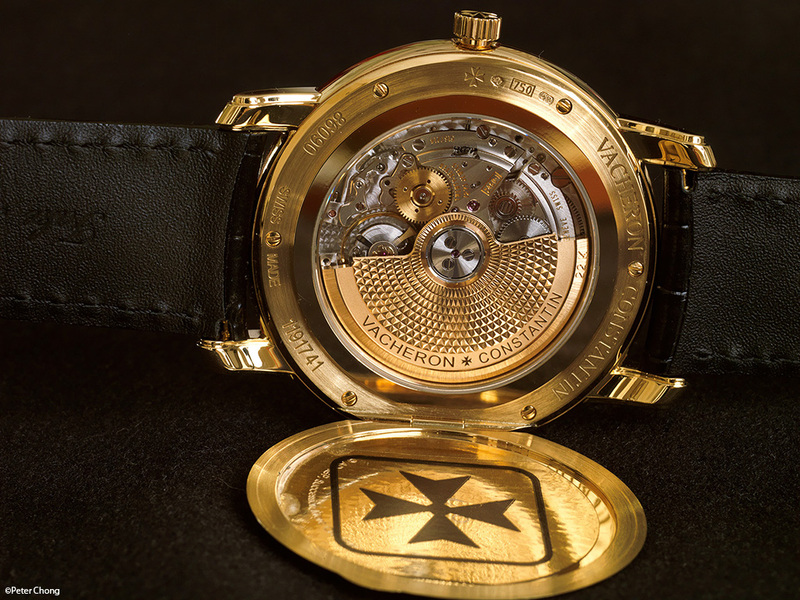 The movement is immaculately finished, as is usual with VC standards. Nicely polished, anglaged, and a very beautiful rose engine turned micro-rotor. But its the dial which is remarkable. Absolutely beautiful. 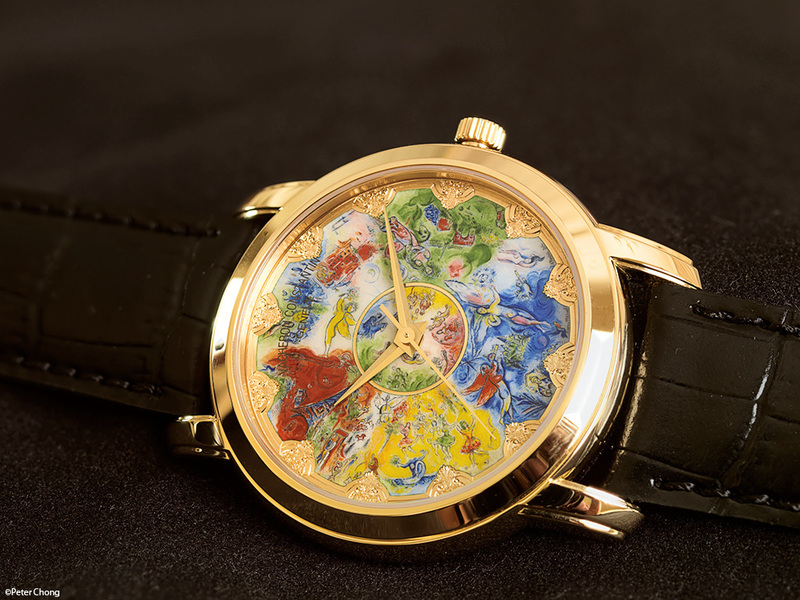 Made as a piece unique and not for sale, this watch will be the first of 14 other watches, done in the same style, also by Anita Porcet. 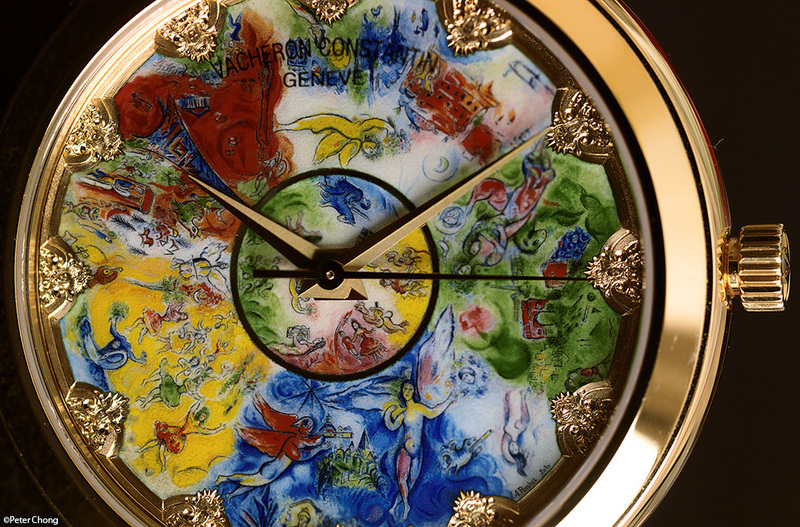 Each of these 14 watches will feature one of the composers that Chagall has featured in the ceiling. The 12 hour markers are hand engraved by an in-house VC engraver. According to the actual gargoyles in the Opera ceiling, these engravings feature the faces of nymphs. Each nymph face has a different expression, and this is well reflected in the hand engraving. Photonote: This is a stitched image, using focus the stacking technique. 10 separate exposures, each with focus on a different position on the dial is focus stacked by Helicon Focus 5.0 to render the entire dial, which is lying at a plane different from the plane of the sensor in sharp focus. Another way to achieve this effect is to use a tilt lens, or a view camera with the digital back attached. Photonote: this image is a 3 panel vertical stitched, and rotated 90deg. Print size is A1 (841mmx574mm without uprezzing). 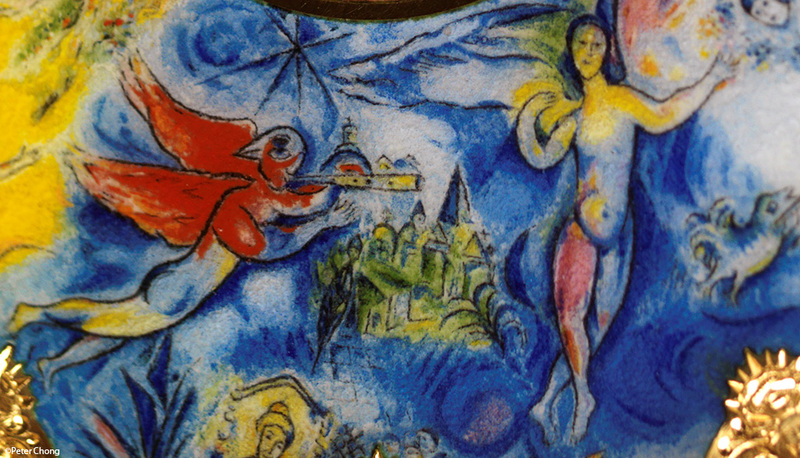 From the VC Press Release: Chagall’s work transformed the ceiling of the Opera House into a vast poetic sky whirling with opera heroes, brilliant musicians, entwined lovers and legendary characters. Concealing the original ceiling painted by Jules Eugène Lenepveu, Chagall’s rich palette with its intense shades and subtle harmonies is deployed over a full 200 square metres, forming an enchantingly luminous flower lit up by the neo-academic gold and purple hues from the era of Napoleon III. Five coloured petals with respective dominant blue, red, yellow, white and green colours each depict two famous musicians surrounded by some of the works they created. The blue one features Moussorgski and Mozart, along with Boris Goudonov and The Magic Flute; the yellow depicts Tchaikovsky and Adam, with Swan Lake and Giselle; Stravinsky and Ravel shine in red with The Firebird and Daphnis et Chloé; green lends a fresh touch to Berlioz and Wagner and the love stories of Romeo and Juliet and Tristan and Isolde; while white with a touch of yellow exalts Rameau and Débussy, along with the latter’s Pelleas and Mélisande. The works of Beethoven, Gluck, Bizet and Verdi are represented in the circle of the dome surrounding the central chandelier. Dotted here and there are some of the most famous Parisian landmarks: the Eiffel Tower, the Arc of Triumph, the Place de la Concorde with its obelisk, and of course the Garnier Opera House itself.